Your physical therapist can help you learn how to use this device, and can provide advice on the appropriate amount of force to use for your specific condition. 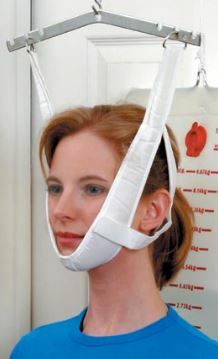 In general, a pulling force of about 20 pounds should be used when starting neck traction. The force should be held for 10 to 20 seconds, and then slowly released. Traction can be applied several times throughout the day. Be sure to work closely with your physical therapist to help decide on the best treatment parameters for your specific condition. If your symptoms worsen at any time during your treatment, you must notify your physical therapist immediately.